By Jordan Abramson Making Hanukkah candles is a perfect way to introduce or strengthen the family holiday tradition. 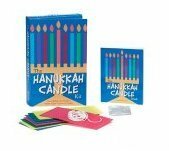 This new addition to our popular line of book-plus kits comes complete with enough beeswax sheets and wicks needed to create 44 candles for the eight nights of Hanukkah, plus glitter to decorate the candles, and a beautiful box to hold them. The 48-page book contains a history of Hanukkah, directions for making and lighting the candles, prayers in Hebrew and English, and recipes, songs, and crafts to celebrate the Festival of Lights. By Bertha Moss Hanukkah, the Festival of Lights, celebrates the victory of the Jews in their battle for religious freedom in ancient Israel. The window story book is a Chagall-like depiction of the former Warburg mansion, home of The Jewish Museum, with a fiddler on the roof. Open the eight numbered windows in sequence on the mansion to reveal the wondrous story of the Maccabee heroes. The Jewish Museum, founded in 1904, is the largest museum devoted to the study of Jewish culture in the Western Hemisphere, and its collection is one of the three finest in the world. Since 1947 The Jewish Museum has been housed in the landmark Warburg mansion on Fifth Avenue in New York City. The window story was co-produced by The Jewish Museum and More Than A Card, Inc. under the auspices of the Jewish Theological Seminary of America. It measures 11 x 15 and has an easel back. It comes in a resealable poly bag. By Arthur A. Levine Based on the experiences of his grandfather and great-uncle's escape from Russia in 1914, Levine's story of two courageous boys should appeal to children. It is almost Hanukkah when brothers Moses and Benjamin flee the pogroms in their small village for Palestine, where their older brother lives. They travel by cart, train, and finally ship, through a number of trials and dangers. Along the way their spirits are sustained by telling the story of Hanukkah to each other, and by their grandmother's lamp. Given to them by their mother with only enough oil to last for a single night, it recreates the Hanukkah miracle by providing enough light for the entire journey. When the captain of the ship on which they are to sail claims they have only enough money for one ticket, they pay for the second ticket with the lamp. The boys mourn its loss, but then realize that they have All the Lights in the Night. Ransome's oil paintings capture the drama of the journey, especially the boys' encounters with the train conductor and the sea captain. They also show the warm relationship between the brothers. Good to read aloud, the story should prove popular for intergenerational sharing, especially in families in which grandparents or great-grandparents emigrated at a young age. By Malka Penn Reinforcing the idea of Hanukkah as a celebration of miracles, Penn gives us a particularly fanciful version of the holiday legend in which a small amount of oil for the menorah lasted for eight days. In Penn's story, it's potatoes, not oil, that are in short supply. Every year at Hanukkah time, Tante Golda removes eight potatoes from her barrel to make the "most delicious latkes in all of Russia," which she shares with all her friends. When a drought leaves her with only one potato at holiday time, she's unable to have her traditional feast. Instead, she shares her only potato with a beggar, a good deed that causes Tante Golda's luck to change. The book's layout--the text is set in ruled columns, and there are odd chunks of unused white space--is distracting. However, the plot is well devised and recounted with verve, and Carmi's illustrations, with their subdued colors and broad, visible brush strokes, effectively evoke a hardscrabble, Eastern European atmosphere, ripe for wondrous things to occur. Tante Golda's latke recipe rounds things out. In this zany tale, an entire household helps a mysterious peddlar make potato pancakes from a mere crust of bread. Includes a recipe the whole family will enjoy making. By Mark Podwal Podwal tells of the creation of the first menorah and how it became the eight-branched lamp with the "servant light" used to celebrate Hanukkah today. Freely drawn color illustrations light up this gracefully told story, which provides readers with a new perspective on the holiday and its symbols. An author's note provides additional information. The story of the menorah is as rich and inspiring as its long-standing tradition of symbolism. And Mark Podwal's distinguished and graceful book brings the story of the menorah, and of King Antiochus, Judah Maccabee, and Hanukkah to a new generation of readers. Featuring luminous paintings, as well as a note from the author and a selected bibliography, this distinctive book is ideal for Hanukkah sharing and year-round reading. By Arlene Erlbach Candle lighting, dreidels, potato latkes, and jelly doughnuts are all a part of this festive day. Readers are introduced to the holiday that celebrates an important victory for the Jews over the ancient Greeks and takes place around the same time as Christmas each year. They are also introduced to important symbols of the day, and learn how to make their own dreidel and play the dreidel game in the craft activity. Read by Pat Carroll and Jackie Cytrynbaum A joyous celebration of Hanukkah that includes the story of Bubbie and Zadie, magical grandparents of Jewish children everywhere, and a spirited collection of songs and music. This holiday collection is the perfect way for the whole family to rejoice in the miracle of Hanukkah. By Stewart Walton Chanukah, or the Festival of Lights, is one of the happiest times of the year for American Jews. Many children already enjoy lighting candles and opening gifts, but Chanukah Fun will encourage families to try a whole new range of activities and projects guaranteed to enhance any holiday celebration. With decorative paper, stencils, step-by-step instructions, and information about the history of the holiday and the Jewish people. By Lisa Rojany During Hanukkah, families retell the story about the courageous Maccabees and the little jar of oil that miraculously burned in the temple for eight days. Now that tale finds fresh expression in this ingenious lift-the-flap rebus/pop-up book. This book was intended for young children, but we have learned to have fun with it in many ways as a whole family. When my child was young we read it as you would any rebus book, so that the child "reads" the pictures and you read the text. Now we like to take this book out at parties for the children, but have the adults suggest completely nonsensical substitutions for each picture and have the children correct us with the proper answers.